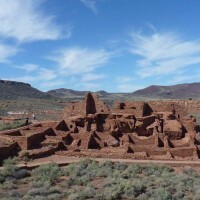 Driving south on Monday from the Grand Canyon, I stop at Wupatki National Monument, an amazing set of ruins that was populated in the 1100’s by ancestors of the current Hopi, Zuni and Navajo. I introduced myself to the ranger and she said they have had artist-in-residence in the past. This would be a great place for the night sky photography. Made a left turn at Flagstaff and on to I-40. Speed limit is 75 mph here, which means many go 80 or more. Take the exit through Holbrook, the nearest town to Petrified Forest. 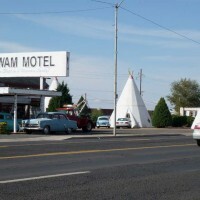 Dinosaur excavations and evidence of native American civilization both exist in Petrified Forest, so giant dinosaurs and teepees have sprung up around Holbrook. I make the mistake of going in the south entrance of Petrified Forest, the long way up to the northern part of the park where I’ll stay. But it’s quite a drive through the park. As grand as the Grand Canyon was, there are some amazing landscapes here. I arrive a the visitors center and check in, they say one of the artists’ cabins is leaking badly, so I’m in one of the staff apartments here near the headquarters. (There are 2 artists in each 2 week period here). The cabins are small adobe (like) houses inside the park near the historic Painted Desert Inn. But you are quite isolated especially at night when the park closes. I’m in a one-bedroom apartment, quite roomy, though pretty sparse. A small walled off patio gives you privacy. I’m in apt. B, I notice there are 4 on the ground floor. The sound of the highway is nearby, but when I open the gate to the parking area, there is a wide view looking south. Sunrises are to the left, sunsets to the right, just around the corner. So not too bad. Somehow I managed to do something painful to my back which makes bending very hard. Good thing is some weather moved in so yesterday, today and tomorrow are partly cloudy with some showers. Not so great for seeing stars. First thing this morning (Tuesday) I drove to Holbrook to shop for groceries and get Aleve, which helped a bit. Then packed a lunch and took a tour of Petrified Forest. There are many overlooks off the 28-mile park road. I gathered notes about where the best locations are for photos. Had lunch in a parking area while a raven stared at me while occasionally making noise. 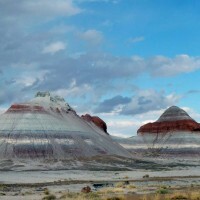 Saw amazing sandstone and other rock formations and mounds of petrified wood.